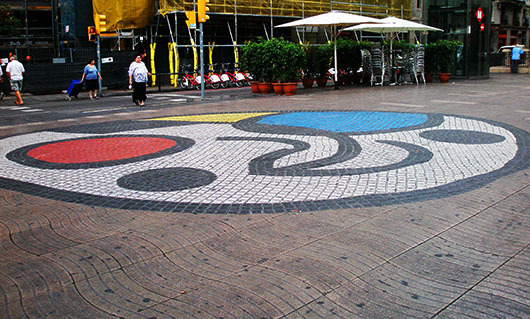 Few tourists that brave the crush of people on Las Ramblas in Barcelona, are aware of the existence of a masterpiece – an original Joan Miró mosaic – right under their feet in the middle of the pedestrian street near the Plaça de la Boqueria! Get there early (9am is early enough by Spanish standards) and you will have it all to yourself. As excited as I was at finding the Miró, my loyalties lie with the muted hues and classic patterns of ancient mosaic floors. Below is a selection of mosaics, that have been cordoned off and are not technically underfoot at present, but still in situ. 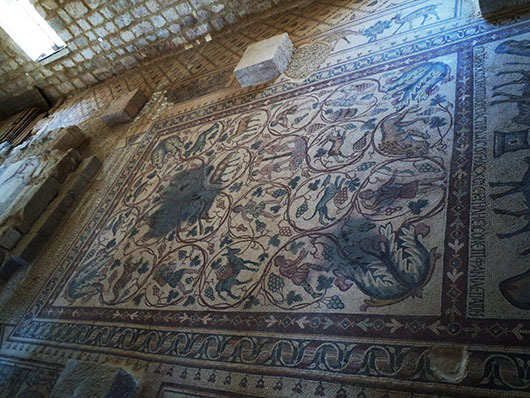 A 1st century mosaic floor from the Church of St. Cosmas and Damian in the ancient Roman city of Jerash in Jordan, also known as the Pompei of the East. 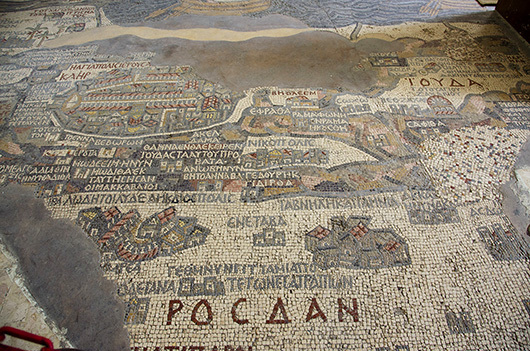 The famous mosaic map of Madaba in the Church of St George, is considered the best representation of the biblical lands, up to 570 AD. After the Islamic invasion a few figurative representations were removed in keeping with Islamic religious codes. We spent a few hours here, on our way to Petra, but an overnight stay might be warranted. No that isn’t a carpet! That is a mosaic floor in a lesser known residence in Madaba. 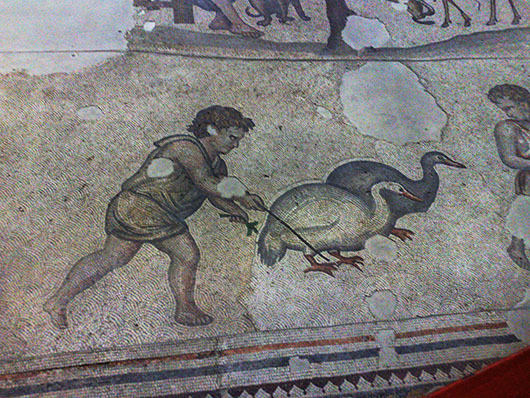 There is conjecture that there might be a whole lot more undiscovered mosaics underneath the entire city! 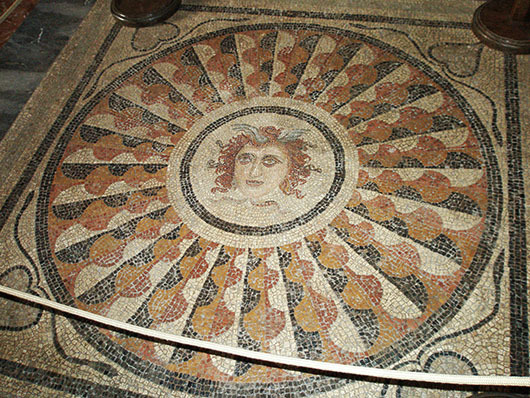 The exquisite Mosaic Museum within the Arasta Bazaar in Sultanahmet, Istanbul displays part of the floor of the peristyle courtyard of the Grand Palace of Constantinople, that was accidentally uncovered during construction work. These 6th century mosaics represent an aesthetic that is absent of religious motifs, showing instead hunting scenes and scenes from mythology, like the geese herder above and the incredible leopards’ kill on the header. This isn’t part of most tour itineraries. But do make the effort if you are ever in Istanbul, you won’t be disappointed. I’m so glad you posted this lovely selection of mosaic floors/walkways Madhu. I do love mosaic floors: they’re simply gorgeous, and seem to be a sign of great luxury and refinement, as the Madaba “carpet” would indicate. Perfect post! I love mosaics too and that made it easier to decide what kind of ‘art’ to write about. Glad you like it too TWLG. Thank you. Wonderful post Madhu. I love mosaics and of those above think I love best the Madaba; how incredible it would be to discover more that are underneath the city. The colors and design on this one are exquisite. Thank you Angeline. 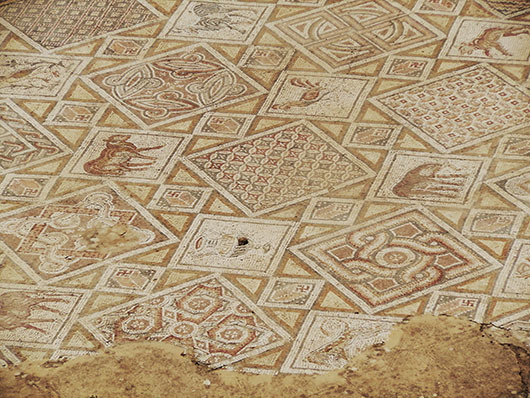 Madaba is heaven for lovers of mosaic. And that’s without Pompeii and Knossos! I agree, Madaba looks really interesting. We went to Pompei in 1985 and my photos aren’t in the best of shape 🙂 I think Madaba is worth an entire day at least. Thanks Jo. Me neither. I hated having to waste my mornings just because nothing would be open till noon. And before you knew it, it would be time for siesta!! Thanks Ameena. I like both the Miro and the ancient ones. Nice post and photos, Madhu. Hi, Madhu, this is a great array of art–I love the history that you give, and the wide range of styles. I’m glad you did, Madhu. I really love to see them all and compare. And when you present, you always share a story for each, and the more stories the better! Thank you Ailsa. It was a fun theme to work on, thanks again. Like footfalls in a mall? 🙂 Doubt Miro envisaged this number of footfalls though! I missed the Miro in Barcelona…I will just have to go back. The mosaics on the floor of the Duomo in Siena are wonderful as well. Most are only uncovered for a few weeks a year. Have been to Sienna, but haven’t seen the mosaics there. A return trip to Italy is definitely warranted 🙂 Thanks for the visit and comment Debra. I’m a big fan of mosaics. Seen all the ones you mentioned in Jordan and loved every single one of them. Been to BCN and managed to miss Miro’s. I was with Catalan friends so will “tell them off” for having kept it to themselves (it’s just not possible they don’t know it’s there!). You are most welcome. And your Catalan friends probably take that art underfoot for granted 🙂 Thank you for the visit and comment. Interesting and I love the photos. The things one can unearth with a bit of patience and Google 🙂 Thanks for stopping by Kate. I am mesmorized by mosaics! These are absolutelty astonishing! Aren’t they Zoe? I am amazed at the details in some of them and the intricate patterns! Thank you for your thoughts. Wow, I’m glad you shared these photos and information! It seems like such a shame to walk on something so lovely. I also think the Mosaic Art as exquisite, unique and beautiful. Thanks for sharing these amazing masterpieces particularly of artist Joan Miro. Sometimes we are too busy and preoccupied to notice that we are standing on top a priceless work of art. Have a blessed day. Thank you Island Traveler. You too. Thank you for sharing another gorgeous part of history and these mosaic masterpieces. Fascinating topic, especially to think that there may be still some left undiscovered! You are most welcome Rufina. Thank YOU for reading and commenting. And most people don’t even realize those works of art existed. Thank you Daffodil. Appreciate your visit and comment. Mosaic is a nice art form. I’ve seen Madaba, but not the ones in Spain. I’ll have to go there some day. The other two were from Rhodes and Istanbul. Spain is wonderful of course. Wonderful Madhu and I haven’t seen any of them which is terrible. When I saw the Turkey tag I thought you would have the pavement at Ephesus? Thanks Gilly. We went to Ephesus on our first visit on a tour and they skipped the terrace houses completely and that is the reason I don’t have any floor mosaics from there. I did have the ones from Hierapolis, but they aren’t that great looking. Me too ;-D Hope there will still be beautiful things to unearth. Who would want to dig up laptops and ipods? Imagine coming upon even more mosaics under the city?! How neat would that be! 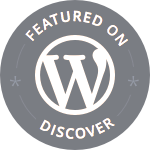 Great post, Madhu – stuff like this totally floats my boat! Interesting post,Madhu – that 1st C mosaic is fascinating and mind boggling. That was extremely interesting to me to see all of these. What a lovely surprise Your post is! Thank you Sartenada. Glad you enjoyed it. Intriguing floor mosaics and designs, good shots!